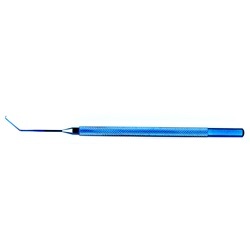 The Rosenwasser Endothelial Stripper, also known as Melles DSAEK PLK Scraper Style 2, has an angled shaft, 11mm from bend to tip, angled 45 degrees and 90-degree angled sandblasted tip. Round handle. Overall length: 125mm.